We’d love your help. Let us know what’s wrong with this preview of Morgan Freeman and Friends by Wendy Wilkinson. Academy Award®-winning actor Morgan Freeman and a star-studded group of celebrities contribute exotic recipes and personal island tales in a splendid cookbook created to help rebuild the hurricane-devastated island of Grenada. In September 2004, Hurricane Ivan ravaged the small Caribbean island of Grenada, destroying homes and changing lives forever. Longtime island-lover Morgan Freeman established the Grenada Relief Fund in 2005. Now comes this beautiful cookbook, bringing together a bevy of celebrities to benefit this island in need. To ask other readers questions about Morgan Freeman and Friends, please sign up. Operation purge cookbooks underway . . . but I'm keeping this one! 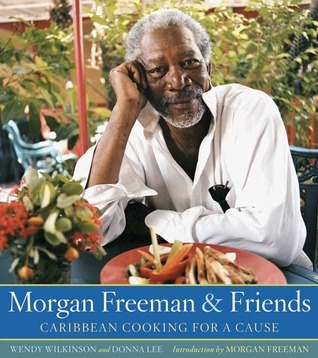 I love anything Caribbean, and I love Morgan Freeman, so I knew I couldn't go wrong with this cookbook. The photography is great, the stories are great, and the recipes are great. I loved all the little anecdotes from some of our favorite celebrities liek Ben Affleck, and Michael Douglas. More than just a cookbook. This is beautifully photographed, but most of the recipes are either for things I'm highly allergic to or just wouldn't eat. It's also not for a casual cook- some of the techniques & ingredients are a bit fussy. Great book about Caribbean Cooking and some interesting stories about some famous friends of Morgan Freeman. Highly recommend it. interesting read but the recipes are a bit of a challenge.